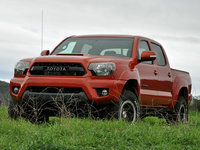 CarGurus has 34,082 nationwide Tundra listings starting at $1,100. It was tempting to rev the Tundra TRD Pro Series trim’s engine just to hear the lumpy, chuffing, machine-gun exhaust note, which Toyota claims is muzzled in order to meet 95-decibel noise limits. Aside from a thirsty engine and a lack of key safety features, the 2015 Toyota Tundra remains a worthy alternative to the most popular full-size trucks, especially when decked out in TRD Pro trim. Outfitted with key suspension upgrades combined with special detailing and paint, a bright orange Tundra TRD Pro Series is tough to ignore. Good luck clambering aboard, though. “Go big or go home,” I mused, as I walked toward the unmistakably orange, unapologetically massive monster that loomed in the parking lot of Toyota’s Southern California headquarters. The 2015 Toyota Tundra TRD Pro Crewmax would be my ride for the day, so I got to go big and then go home. 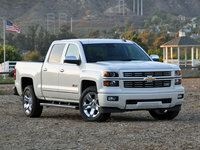 It’s easy to forget, as a suburban mom, just how essential pickup trucks are to the country’s economic engine. Pickups are the most popular vehicles in America, and outside of the nation’s urban centers, where work is measured in sweat and strain rather than pages and pixels, the pickup truck is often a necessity for towing and hauling in addition to getting its driver to and from work. After sundown and on weekends, pickups serve another important purpose, and that’s getting their owners to where they want to go rather than where they need to go, and looking good in the process. Hitting all the sweet spots when it comes to a dependable truck for work and for play, the 2015 Toyota Tundra TRD Pro is especially capable when that play involves remote locations accessible by traversing lots of dirt, plenty of mud, and more than a few boulders. Equipped with Toyota Racing Development off-roading hardware, the TRD Pro package installs a dual exhaust system, upgraded shocks, a higher ride height, a front skid plate, and styling enhancements that deliver a big dose of attitude. You can get it on Double Cab or Crewmax versions of the 2015 Tundra. 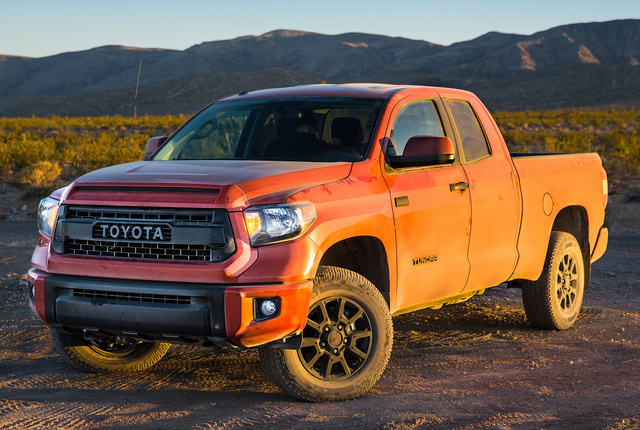 Geared more toward recreation than occupation, with look-at-me panache to match its go-anywhere personality, my Tundra TRD Pro was an eye-catcher, its colossal bulk covered in Inferno Orange paint. A rolling parade float, this handsome beast also featured blacked-out 18-inch wheels, a bespoke grille the size of Texas, and a bearing worthy of a royal hunting Mastiff. In order to be a beast, you must possess the heart of one, and a stout heart indeed resides beneath the Tundra TRD Pro’s hood. Cranking out 381 hp at 5,600 rpm and 401 lb-ft of torque at 3,600 rpm, the Tundra’s 5.7-liter V8 engine can power through almost any obstacle, with the tuned exhaust system adding an extra-aggressive note. It was tempting to rev the engine just to hear the lumpy, chuffing, machine-gun note, which Toyota claims is muzzled in order to meet 95-decibel noise limits. Abundant power is available across the engine’s rev range, quickly swelling with a push of the accelerator pedal. Rated to tow 9,800 pounds and to carry a payload of 1,575 pounds, a Tundra TRD Pro can fulfill most, if not all, towing and hauling needs. While Toyota offers Tundra buyers a choice between two V8 engines, emerging trends in full-size pickups include turbocharged 6-cylinder engines, turbodiesel engines, and features like direct fuel injection and cylinder-deactivation systems, all of which are designed to increase fuel economy. Toyota is behind the times in this regard, and, as expected, my Tundra TRD Pro quaffed fuel like a pirate might rum. At least my week-long average of 14.5 mpg came close to hitting the EPA’s 15-mpg rating for combined driving. Official estimates are 13 mpg in the city and 17 on the highway. Regulating the 5.7-liter V8’s power, a 6-speed automatic transmission with a manual shift gate sent motive force to the truck’s rear wheels. The transmission includes active shift logic designed to hold a lower gear for climbing and descending hills and features a Tow/Haul driving mode. A part-time 4-wheel-drive system featuring Active Traction Control is standard for the TRD Pro. 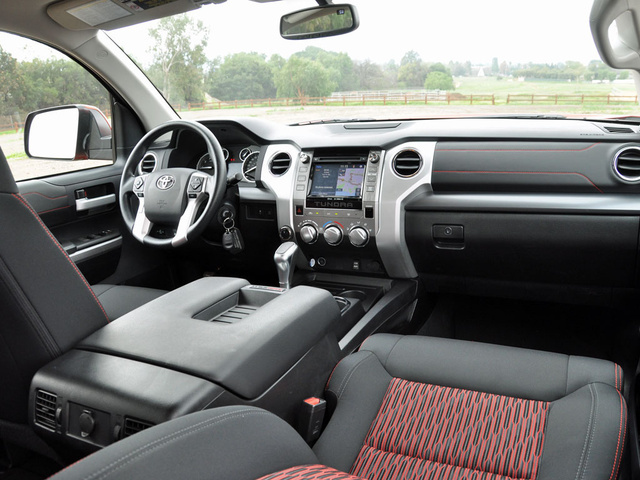 Perhaps unexpectedly, the TRD Pro treatment dramatically improves the Tundra’s ride quality. The revised suspension and big, fat tires effectively soak up crappy paved surfaces and, in combination with 10.6 inches of ground clearance, make this truck terrific off-road. Width is a problem when squeezing down narrow, brush-lined trails, though, and I did get my test truck’s trailer towing hitch hung up on a couple of occasions. Plus, if you need to get this rig turned around, it requires more real estate than is often available. On pavement, where most of these Tundras will spend most of their time, the brake pedal requires constant adjustment in order to bring the truck to clean, consistent stops, but the steering provides decent feel and response, and the truck handles well enough in terms of roll resistance and weight management. Just remember that the broad-shouldered off-road tires have a low cornering threshold. 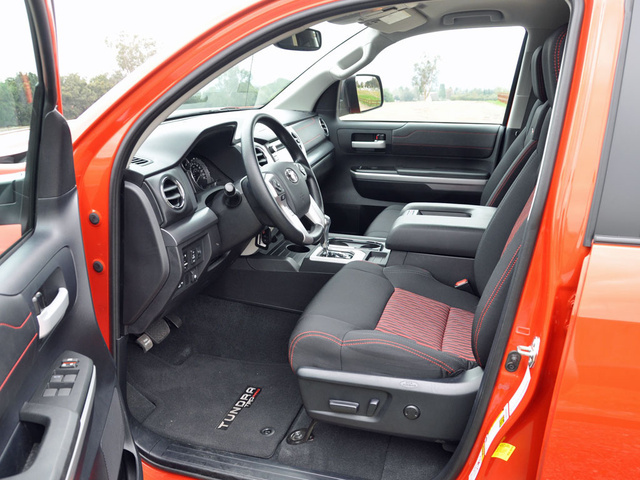 It’s no easy feat getting into the Tundra TRD Pro’s cab. Without step rails, or even a grab handle on the driver’s side windshield pillar, you literally need to climb into this truck. You can probably add something to make entry and exit easier, but then you’d be compromising the truck’s off-road capabilities. Once you’re perched upon the driver’s seat, your view of the world is demonstrably different, as you tower over surrounding vehicles. Minivans are suddenly the size of MINI Coopers, while midsize crossover SUVs appear to be compact hatchbacks. Don’t forget to wave to neighboring truckers, as they’ll be able to see you. You’re also going to need to be careful in traffic. 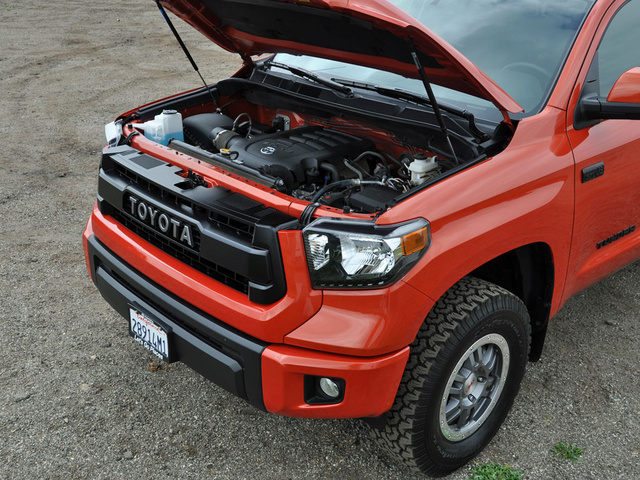 Because of the Tundra’s bulging hood, it’s hard to see directly in front of its ginormous grille. This Toyota could definitely use a front-mounted camera monitoring system of some kind. Comfort is easy to come by, especially for people riding in the Crewmax’s huge rear quarters. Limo-like legroom and a wide bench seat mean that 3 adults will be happy for long-distance travel. 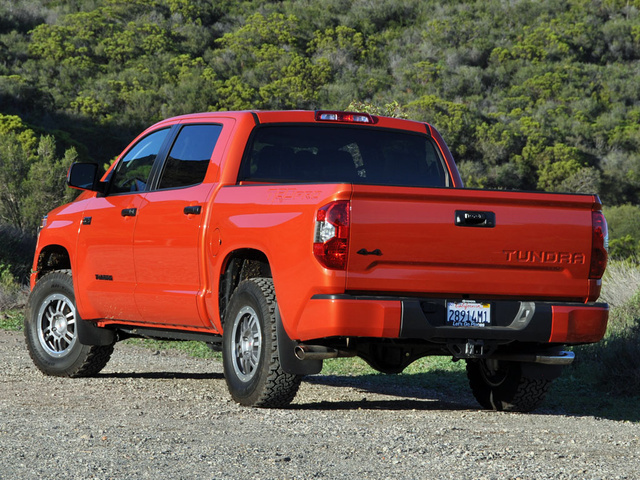 Hard plastic surfaces dominate the Tundra’s cab, which isn’t surprising in a full-size pickup truck. The TRD Pro shows just enough interior refinement to avoid being labeled cheap, and while the soft surfaces for arms and elbows could use additional padding, and the parts-bin approach to the controls is not ideal for a truck frequently driven by people wearing work gloves, I thought the Tundra’s blue-and-white nighttime instrument lighting was fantastic. Toyota also offers lots of useful bins and trays, along with a huge, compartmentalized glove box and giant square center-console storage area. In case you need more space for stuff than you do people, or if you simply want to protect your cargo from the elements or thieves, you can put bulky items in the roomy cab thanks to rear seat bottoms that flip up and out of the way. 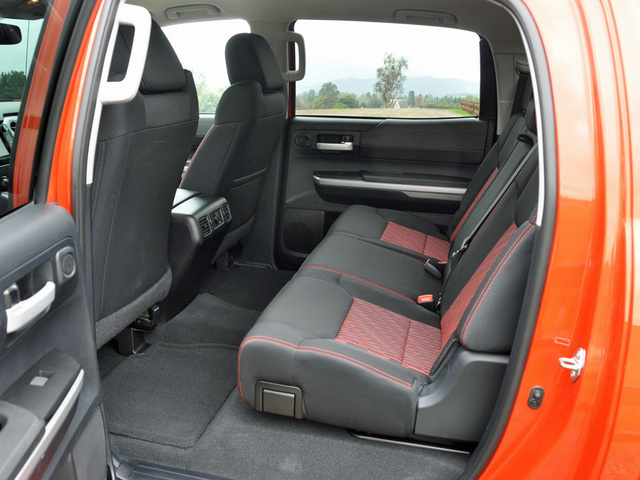 Speaking of utility, getting a Tundra Crewmax means that you maximize passenger space at the expense of cargo-bed space. The Crewmax’s short bed measures 5.5 feet long, compared to the 6.5-foot bed of Double Cab versions and the 8.1-foot bed of Regular Cabs. My test truck’s essentially square bed offered decent room, though, and included a spray-in liner to protect the finish. The dampened tailgate drops slowly and softly, an appreciated touch, while a bright rear cargo light facilitates both work-related tasks and friendly gatherings that extend well into the night. A premium version of Toyota’s Entune App Suite infotainment system is standard for the Tundra TRD Pro, equipping the truck with a 7-inch touchscreen display, a navigation system, HD Radio and traffic/weather data services, iTunes song-tagging capability, a quick-charge USB port, and more. Unfortunately, buyers cannot upgrade this system to the JBL premium audio system offered in other versions of the Tundra. With Entune App Suite technology, the infotainment system syncs with your smartphone so that you can access a number of mobile applications and services right from the in-dash display screen, including Pandora, Facebook Places, Bing search, and others. One of my favorite things about the system is that Toyota still employs real knobs to control system power, audio volume, and radio tuning. Looking for anything more sophisticated in terms of technology? Aside from a few safety-related features, the Tundra is lacking in the way of gee-whiz-bang technology, and that’s just fine with me. Unfortunately, one safety feature that needs to be offered on every Tundra is not available on any of them: Safety Connect services. Normally, and irritatingly, Toyota reserves this service for only the most expensive trim levels of any given vehicle. But when it comes to the Tundra, you simply cannot get it, no matter how much money you have to spend. Safety Connect is a subscription service that is usually free for a short trial period following purchase. In the event of an accident, the automatic collision-notification feature automatically summons help to the scene of the accident. The system also includes an SOS emergency button that puts a driver or passenger into immediate touch with someone who can help. A blind-spot monitoring system with rear cross-traffic alert is available in some versions of the Tundra, but not the TRD Pro. That’s a shame, because both would come in handy. Even with the gigantic side mirrors, the Tundra rides so high that it would be easy to miss a small car puttering along in the truck’s blind spot. Thankfully, a reversing camera is standard; it would be nearly impossible for me to get out of a crowded parking lot without one. As far as crash-test performance is concerned, the National Highway Traffic Safety Administration gives the 2015 Tundra an overall rating of 4 stars, just one notch below its best rating of 5 stars. The Insurance Institute for Highway Safety (IIHS) gives the Tundra Good commendations in all assessments, though the truck’s performance in the small overlap frontal impact test has not been assessed. 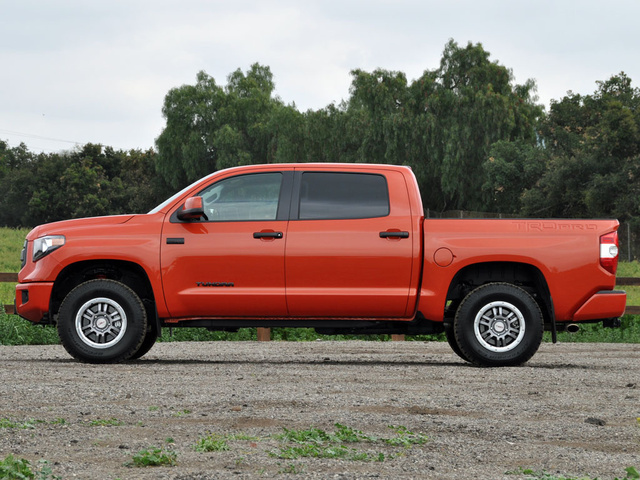 Keeping in mind the Tundra TRD Pro trim’s curb weight of 5,625 pounds, the same as two Toyota Corollas, there’s a good chance this big truck will protect occupants in collisions with almost any other type of vehicle. Toyota desperately wants to sell you a full-size truck. Designed, engineered, and built in America, the Tundra is the second most “American” truck you can buy in terms of its total impact on the economy, right after the Ford F-150. This fact, combined with regularly available rebates and financing deals, makes a Tundra appealing if you’re not already loyal to another automaker. You’ll need to save money up front, because a Tundra will cost you at the gas pump, contributing to an average cost-of-ownership rating from Consumer Reports despite a free scheduled maintenance program in effect for the first 2 years or 25,000 miles of ownership. On a positive note, ALG predicts that a Tundra will be worth a significant portion of its original value when you decide to sell the truck. Reliability is a bright spot, too, with both Consumer Reports and J.D. Power predicting that a Tundra will be dependable over time. Although the Tundra’s underlying engineering dates back to the 2007 model year, a program of steady improvement as well as a thorough refresh for 2014 have kept the Toyota reasonably competitive. If the automaker can figure out a way to eke more mileage out of the V8 engines, it will be even easier to recommend this truck. What's your take on the 2015 Toyota Tundra? 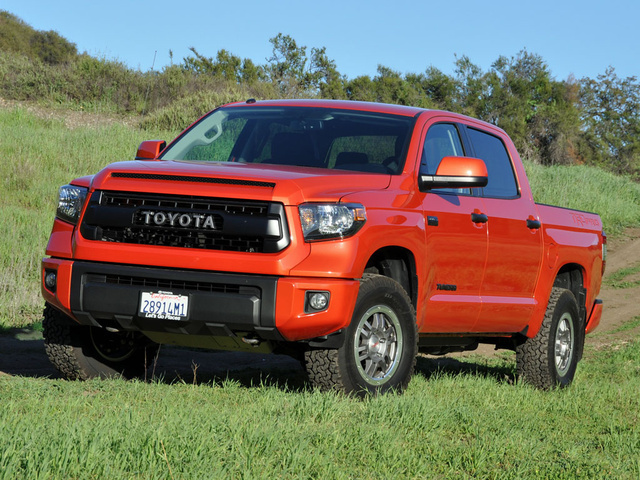 Users ranked 2015 Toyota Tundra against other cars which they drove/owned. Each ranking was based on 9 categories. Here is the summary of top rankings. Have you driven a 2015 Toyota Tundra?